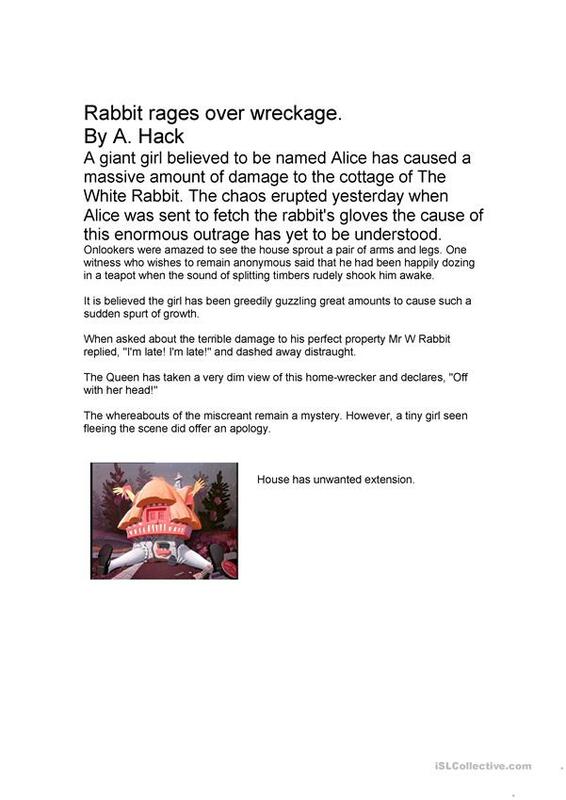 A newspaper article for deconstruction and modelling journalistic writing on theme of Alice in Wonderland. The present downloadable worksheet is recommended for elementary school students at Elementary (A1) level. It is valuable for consolidating Reported Speech (Indirect speech) in English. It centers around the topic and words of Storytelling. ablakemore is from/lives in United Kingdom and has been a member of iSLCollective since 2011-04-03 12:52:05. ablakemore last logged in on 2012-09-15 08:16:34, and has shared 1 resources on iSLCollective so far.